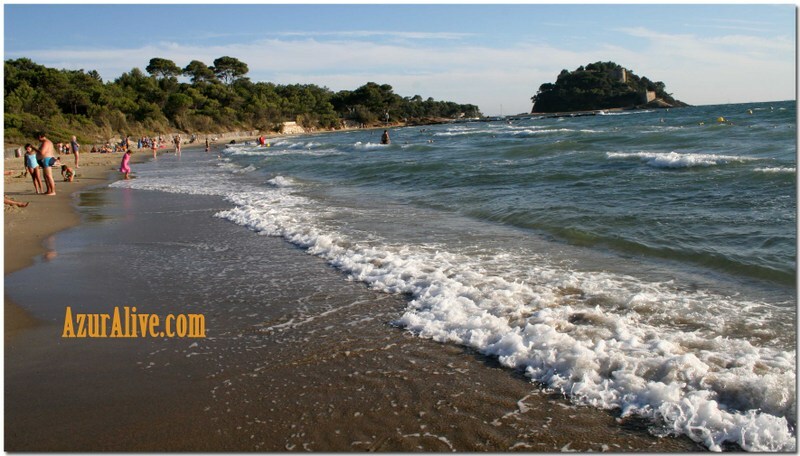 Agay is my favorite large beach on the eastern tip of the Var, close to the Alpes Maritimes. The Var hosts many great beaches, especially towards Les Issambres, St Tropez, Gigaro, Hyères. This one is special. First, the site. The Esterel Mountains peer over this little beach town of Agay, with gorgeous fiery red pitons and rocks overlooking the bay. The bay of Agay sparkles like a round emerald, with the beach running like a crescent around half of its rim. So there's plenty of space. And with the volcanic hills behind, you think you're on an exotic island. A the eastern edge of beach, you can rent sea kayaks, dinghies, and large windsurfing boards for more fun in the water. On sea kayaks, you can explore the beautiful rocky coastline to the west. It's a treat! Check-up the Wind Club d'Agay for details, also the town's municipal club right next door. Agay sports a series of decent snacks and even nice restaurants that aren't out to rip you off (see below for our tested recommendations). To wrap it up, you'll find public showers right on the beach for rinsing. The beach is not cordoned off into private paying slices so your wallet can relax with you while you soak in the sun. Beach mattresses are offered on one corner of the beach, at private Maobi Plage's restaurant and bar. Summer is obviously the most popular time for visits to the little resort town of Agay. Even though it gets crowded, it doesn't feel overwhelmed due to the size of its long beach. Two restaurants to recommend, one cheap but good and one pricier but very good. La Belle Vie Café. You can't miss this restaurant at Agay' main round-about, in front of the beach. It serves hamburgers, bagels, sandwiches, large salads and has a nice relaxed feel on its terrace. Open from April to October. Affordable with a bagel lunch going for 7€ in 2012. For something more upscale, with nice provençal menus around 25-30 €, this is a good choice: Côté Jardin. Open from April to October, closed Monday for lunch. Set behind the Belle Vie Café, off the D100 road that heads inland toward the Esterel Mountains. The sandy beach of Agay runs all along the bay, by the Boulevard de la Plage, from the port to the west to the nautical station to the east. Further out east in the bay, there's another smaller beach carved into the bay called La Baumette. La Londe les Maures sits on the French Riviera by the sea, smack in the middle of Hyères and Bormes les Mimosas. It may not have the old-town charm and history of its neighbors Hyères and Bormes les Mimosas. What it does have are boat-loads of summer-time activities from sailing to kayaking to fishing to discovering the golden islands of Hyères just ahead. Not to mention the interesting ornithological and botanical garden with its exotic birds. Plus many seaside restaurants by the port. That makes La Londe les Maures popular with families and the young & active crowd. And best of all... it offers a string of clean, wide sandy beaches. 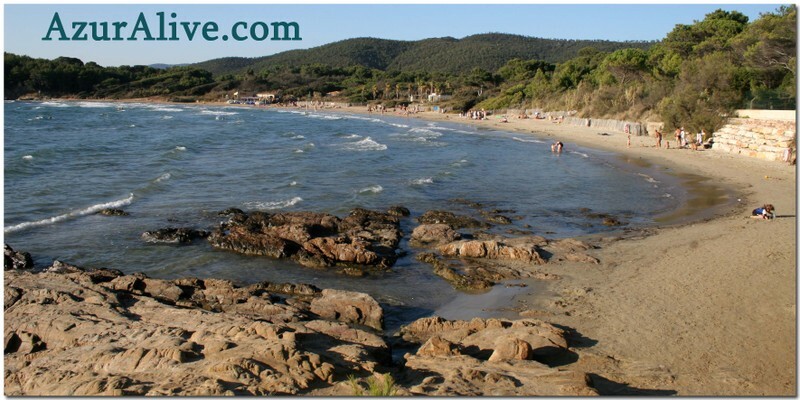 What we like about the La Londe les Maures beaches is the variety. Within walking distance of each other, you'll find four nice and wide beaches of golden sand. The Miramar Beach. Pictured above, the Miramar beach sits to the west of the Miramar port in La Londe les Maures. To reach it, when you walk toward the port facing the sea, head to the right (west) and continue along a pleasant port with its many restaurants. The beach begins where the port ends. Miramar beach is very wide and convenient with restaurants and snacks just behind. In the summer, it sometimes sports inflatable slides and play area on the sand. The only hic is that it's not shaded. Smaller and to the east of the Miramar port, you'll find the Tamaris Beach. To reach it from the port, walk over the pedestrian bridge heading east and you're there. We find it a little more crowded than Miramar and not as wide. Continuing east, you reach the long stretch of the Argentière beach. All of the beach is public. You'll find no fancy restaurants on site, just a tiny snack as well as a couple of public bathrooms, three lifeguard surveillance towers and an area marked off for windsurfing boards and dinghies. With this minimal setting, you would expect few folks. Not so. Many folks camp or stay in the area behind Argentière. They love this beach for its wide expansive feel, the view the Bregançon fort in the distance and the Islands of Hyères in front. The pine trees in the distance give it a tropical feel. And thus it's busy in the summer. However, the sandy beach is very long and wide and rarely feels compact. If you're like us and enjoy walking, you can even reach our favorite beach in the area: Pellegrin Beach. Just continue walking on l'Argentière heading east. Pellegrin sits in a little bay and is wilder than the above beaches closer to La Londe les Maures. It isn't supervised. You can also reach it by car (car park costs 6 euros as of 2012). And if you're a good walker and are equipped with enough drinking water, sun hat, sun protection, you could continue and reach another one of our favorites closer to Bormes les Mimosas: Plage de Cabasson. If you're looking for a bit of a splurge, you can stay in an apartment on the grounds of a provençal winerie at the Chateau de la Pascalette. We're not affiliated with them, but have heard only good things from travellers who stayed there. You'll find the beaches on the below Google map. They're popular in the summer. After October, they hibernate. They're warm as the bay that hosts them is shielded from most winds, tucked behind the Antibes cape to the East and the Sainte-Marguerite island to the South-West. They're the sandy beaches of Golfe-Juan. Golfe-Juan sports a stretch of 3 kilometers of sand. Not a large stretch, mind you. And that's my main issue with the Golfe-Juan beaches. They're OK, but narrow, squeezed between the Mediterranean Sea and the railroad tracks. This crowds them to tears during the peak season mid-July to mid-August. Plus they don't have the charm of smaller (still crowded) beaches of Antibes or Beaulieu, for example. That has kept them off our "Best Beaches" of the French Riviera list. But... we're willing to make an exception after a repeated positive experience with a slice of beach. The Golfe-Juan Plage du Midi beach makes an elbow as it reaches the side of Camille Rayon Port. That beach feels roomier. From the angle, you see the coast covered with bright beach umbrellas and towels. You're not necessarily crammed into this one and you get a nice view too. And since a good beach day means a good overall experience, we think some of the restaurants are good to great. Not all of them are worth a review, but we're partial to the Bistro du Port for their excellent fish. Try their Plat du Jour daily selection for around 15€ at lunch (summer 2012 prices). They're a little further out in the old port. And right on the beach, Passoa Beach is also good. As with most beaches on the French Riviera, the beaches of Golfe-Juan are parcelled out into private and public sections. The private sections of beach rent out lounge chairs with plush mats and umbrellas for a half-day or day. At the edge of the Camille Rayon Port, you'll find chairs and mats for rent at the Le Vieux Rocher restaurant and lounge and at the So... Beach or at the Passoa Beach. This 2012 Summer, they rent for about 14€. But you can also place your beach towel on a free piece of public beach to the side. We would not drive out of the way to reach them, but if you're in the area, try the beach out for a day to recharge those batteries. At the eastern edge of the new port of Golfe-Juan, the Camille Rayon port. The stretch of French Riviera coast between Les Issambres and Sainte-Maxime counts a fair number of sandy beaches, each with a name and personality. While one of the better loved ones is Plage de La Nartelle for its fine sand and clear waters, I'm voting Sainte-Maxime's Plage du Centre Ville as a "Best French Riviera Beach". Practical for its location: downtown, right in front of the Casino. No need to haul beach stuff too far away if you're in Ste Maxime. Practical for its public and private sides: there's a free public section and a string of 3 on-the-beach restaurants that section off their square of beach and rent parasols, cushiony lounge chairs. The Casino Beach Restaurant, the Havana Plage, and the mis-nommed Paris Plage. Yes, a "plat du jour" at the Casino Beach restaurant is still reasonable. Last weekend, prices were just under 12€ for a bavette of beef steak on their daily special board. Practical for its very clean public toilets in the building that hosts the Tourism Office. Free, but tip is welcomed and encourages spotless maintenance throughout the day. And practical for kids given the number of yum ice cream shops right on the promenade sea-facing Simon Lorière and its merry-go-round and nearby playground. It's practically full in mid-summer. Come early enough, spread your beach blankets and reserve your spot for a lazy lizzard day. There's also no shade so consider bringing a parasol. Find it with your eyes closed in Sainte-Maxime, by the Casino Barrière, along the "Allée des Champions" promenade that sports the handprints of sports champs. On the northwestern side of the Saint-Jean Cap Ferrat peninsula, this little beach doesn't have sand like others in our "Best Beaches of the French Riviera" category. It's a pebbled beach, with pebbles tiny like rounded gravel. And its small. Not the kind of beach where you stroll for a long walk with your feet lapped by the sea. On Plage de Passable, many folks sit on a lounge chair with a book in hand and a refreshment on the side. But the water by Plage de Passable is clear, warm and calm, sheltered by the cape ahead of it and the cove that surrounds it. The great deep Rade de Villefranche-sur-Mer is just ahead. And not far behind the beach, the Villa Ephrussi de Rothschild with its extraordinary decors and its nine themed gardens, and the Saint-Jean-Cap-Ferrat Zoo. Looking for the best beaches on the French Riviera? 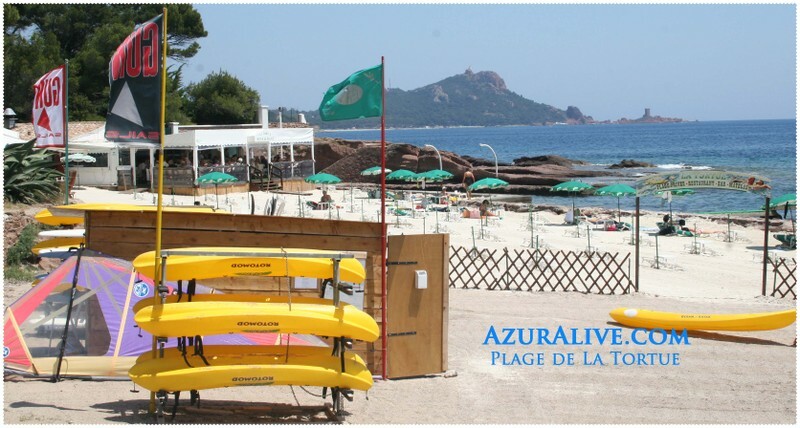 As you know if you drop by AzurAlive regularly, for beaches, I'm partial to the Western Côte d'Azur. Sorry Nice, but the best French Riviera beaches sit to the west of Cannes. 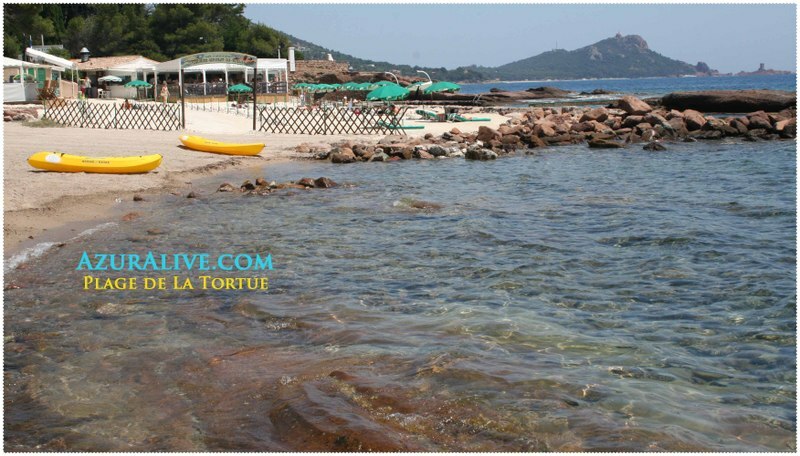 Beaches by St Tropez, Le Lavandou, Cavalaire, in islands of Hyères, are wider, sandier, wilder than their their cousins to the east of Cannes and Antibes.That said, you can still find nice sandy beaches on the eastern French Riviera. The eastern French Riviera counts plenty of fine beaches. Here's a sandy beach that's small, but pleasant. It's tucked right under the Fernand Dunan promenade, in front of the white Belle Epoque Casino in Beaulieu-sur-mer. Not huge, but not a handkerchief either so there's room for everyone. From the beach, you can ponder over the size of the yachts in the nearby port or admire the Mediterranean style of the Villa Kerylos to the east. The transats and beach umbrellas for rent add a splash of color, but you can have fun at the beach without renting anything. In the commune of Bormes-les-Mimosas, not too far from La Londe-les-Maures, behind vineyards of Cote de Provence, you can visit two beaches for the price of a single parking ticket. To the north-west, the Plage de Cabasson offers a wide and almost wild expanse of fine sand, a beach security post, a summer-time beach bar and yellow buoys to demarcate the swimming area from the security boat channel. Here, kids of all ages build sand castles, jump in waves, and body surf. While the shore is gorgeous, the sea is often rougher here due to open exposure to wind. Folks with hiking shoes and light packs on their backs cross the beach and hop up the rocks on the Sentier Littoral hiking path. The beach of Cabasson brims with life. To the south-east, the pebble Plage de Brégançon beach pulls you into the serious realm of politics. Here, you might spot Nicolas Sarkozy swimming around the austere looking rocky island of Bregançon and its fort, or jogging by vineyards. Fewer beach balls bounce around. A helicopter might swerve in out of nowhere for a closer look at the fort. You feel the gaze of secret security eyes pore over you as you swim close to the buoys that encircle the fort. The Pointe du Diable or Devil's Point separates the two beaches. We voted Plage de Cabasson as a Best Beach winner. If you're looking for a tad of sandy seclusion around St Raphael, I'll let you in on a secret spot. It's a stretch of golden sand next to a popular resort town where you can actually lay down your double-sized towel. As if painted as a backdrop to the beach, you see the reddish Cap du Dramont peninsula, its white semaphore and its crazy little island with a square tower. The beach is sheltered from the waves thanks to a reef of red lava flow that runs parallel to the beach and cordons off a shallow pool. It's Plage de la Tortue by Boulouris. To reach it, hop on the Route de La Corniche or N98, and stop between Saint-Raphael and Agay at the intersection with Boulevard de la Mer in Boulouris. On foot, head on down the path in front of the seafood restaurant l'Olympe and take 40 steps to the sea. You can also get there by train, stopping at the Boulouris station and heading straight down Blvd de la Mer to the beach. The beach is all sand, of easy access even if not right into town, and yet not too crowded not even on a pipping hot day in late June. The La Tortue Restaurant that's by the beach is well-known of those who enjoy a splurge of seafood while practically dipping their feet in the sea. Beach mattresses line up prettily on the restaurant's private beach. The private sand appears a little whiter than the one next door on the public beach. I'm not a fan of fenced out beaches with plush mattresses, but some folks prefer when the beach is watched over by a life guard - the private one here is and the public one isn't. Your choice. Either way, this turtle beach makes an excellent spot for slowing down. "Yes, nature is so... well nice and natural, but tell me - what is the best beach in the area?" So here goes. Every once in a while, I'll scribble my personal views on a wonderful beach in the Var side of the French Cote d'Azur and post them on the Best Beaches category of AzurAlive.com. There are plenty, and they're not always the better known ones. And I'll speak my mind on the most heinous ones too. There are plenty of those as well. It's a crowded beach in the summer, only a half-hour walk west from the one and only village in the island of Porquerolles, the largest of the four Golden Islands by Hyères. But the sand on this beach is white like a Sea Daffodil and soft like sifted flour. The ends of its cove are made of schist rocks, layered and sharp edged, like the rocks of the Maures mountain to which the islands of Hyères belong, geologically. To the back, a forest of pine trees. At the entrance to the beach, a set of wooden bicycle racks for parking the nuisances cycles, the only authorized vehicles on the island. Note, in the summer, bikes outnumber cicadas. You decide to lay your beach towel on the sifted flour. Where the water meets the shore, your feel your feet dig into piles of brown strips of Posidonia, thin strips like tape. They smell of salt-crusted seashells. Kids kick them up in the air and giggle. Little strips stick to their feet. Seagulls join in with strings of strident mocking squeals. This is a family beach. Beyond the brown carpet, wavelets gurgle and barely ripple the water. You walk into the sea, pulled in by its color - turquoise, like a touched-up postcard of an exotic sea. Walking out to sea down the gentle slope, it takes a while to immerse yourself with only neck and head above the water. You face the beach and its giant swimming pool. You think: "I'm inside a limpid mirage." Could it be early afternoon? You feel like a bite to eat. The snack bar at La Plage d'Argent's restaurant, the only one on this privately owned but open to the public beach, serves average half-stale snack food as per our latest visit there in 2007. You might have better luck with its full-fledged restaurant on the wooden deck facing the sea. Their local Rosé wine, a Domaine de l'Ile Cote de Provence, chilled and sipped on such a warm day, has you forgiving them. It's grapes are grown and pressed in the wind-kissed plain down the footpath from the beach, towards the Pointe du Grand Langoustier. The Rosé is a delightful mix of grenache, cinsault, tibouren and mourvèdre. What more could you ask of a beach? Your return to rest on the sifted flour. One of these days, you will lift off from Plage d'Argent and fly like a bird around the island. For reservation to Porquerolles, check out La Maison du Tourisme in Hyères. They sell ferry boat tickets too. And if you're interested in learning more about the island and hiking around it, take a look at the Golden Islands category on this web site.